implementing a transit lane system across the airport precinct between December 2017 and 2020 for buses and high occupancy vehicles. Given the distances between their commercial precinct and the terminals I hope that the project also includes other improvements to walking and cycling in the area. It’s also worth noting that their masterplan includes a pedestrian and cycle link shown as number 6 below. But it’s the transit lanes and improved access for buses (and taxis) that are likely to have the biggest impact. We know that Auckland Transport and the NZTA are busy looking at what can be done to improve access for buses outside of the Airport precinct so this work should help move buses inside it. Hopefully we’ll hear more from AT/NZTA on what they’re going to do soon. Our preference is for some quick, short term improvements to connect with the rail line at Puhinui. developing new traffic management plans for use when the airport roading network is particularly busy. They also say they’re working on additional projects that will be announced in the future. No plans to sort out the mess they have made at the pickup/drop off to the Domestic Terminal. Sometimes you can’t get out of Laurence Stevens Dr onto George Bolt because of a solid queue they have created going in. Maybe they include fixing this in their last bullet point. My suggestion is revert to the old drop off arrangements as they worked. I had to laugh at their mention of upgrading lane configurations. They have been doing this continuously for the last few years and all it appears to do is confuse people. Last I was there I was watching the drop off/pickup or whatever it was had cars sitting in there way longer than the time limit it had posted. People have done that since the late 1960’s probably. But only an idiot would restrict the space available to the point where the queue blocks all access in and out. 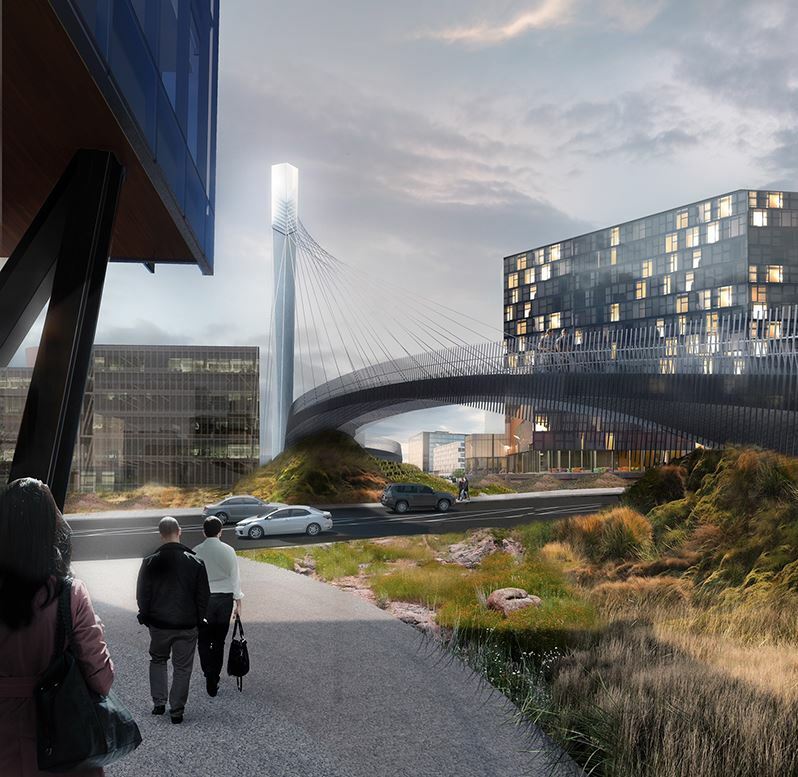 That pedestrian and cycle bridge looks great. Still such a shame that most people will have had to drive there in order to walk across it though. The 380 bus service should be running at least every 15 minutes, preferably 10 minutes, from first rail service to last. It provides a very good connection which I’ve used a few times now, but only if your flight gets in at a time that happens to link up with the half hour frequency. Getting to the bus stop and seeing the next one is 29 minutes away is no use to anyone. This should never have been dropped from the frequent service levels it was supposed to be in the southern New Network. Still can’t believe how AT crowed about saving money on the southern network, but at the same time doesn’t have enough money to run this 380 service properly. as an out of towner and a user of the 380 it was disappointing to see it not running more frequently. -1, no reason to charge a special airport fee. The airport should have been forced to build the rail way tracks and station and give AT free and exclusive use forever as part of resource consent. Most cities i’ve been to with rail from the airport seem to charge an extra fee. Maybe not as much as Sydney but it would help paying it off. And then nobody takes your train, because it is too expensive for day to day use. The main thing to remember is that air travellers are a minority of people going to an airport precinct each day, the majority are actually workers. Air travellers are the minority going to an airport precinct? Sorry, you’re going to have to back that statement up with some real figures – it just does not make sense. If you are talking about people going to work in other businesses that may happen to be within a few kilometres of an airport, then yes, maybe that is true. But how many other people? Surely, surely the majority of people going to an airport are going to fly, or drop someone off who is going to fly, or pick someone up who has just flown. So – the majority of people who are going to the airport really don’t want to have the bother of housing a 1.5 tonne piece of steel and rubber sculpture while they are away – so I’m sure that many people would prefer to have someone else / something else / do the driving and parking i.e. they would be happy to take a train. The pricing should be set to work for Auckland, and that means making PT more attractive and taking a car less attractive. The Sky Bus and any future rail options to the airport need to be cheap. I’m all for adding costs to people who fly, but not via the PT system. An airport tax specifically for PT would make sense. Developing the industrial area around the airport so that lots of people work there, without improving the PT, has had the predictable effect of increasing the number of people driving out there. Now we scurry to fix it. Dedicated bus lanes to the airport, more, cheap bus services and the removal of the additional parking from the airport plans are the first things that need to happen. Rail next. Sorry to be precise I should have said the largest group are actually workers, not the majority. But air travelers aren’t the majority. Yes I am talking about the whole airport precinct, it is a large employment zone and increasingly a retailing destination. Over 20,000 people work in the area, and they are talking about that potentially doubling in the medium term. Bridge will be great it seems, good view from up top too. Transit lanes good thing too, interesting what they have come up with using their own funds I take it. 1400 more car parks. I guess that means more people can drive there. How about a monorail from the international to domestic to puhinui station. No one has ever lost money on a monorail – except maybe Sydney where light rail would have been $20 million cheaper to build, service more passengers per hour and cost 40% less for a ticket, but the monorail system prevailed. Why on earth would we build a bespoke rail system when there are dozens of off the shelf rail systems available? What is the difference between monorail and LRT other than the number of rails? Also, he says that a silly monorail would go from the intl. to domestic and to Puhinui but the airport is now starting on building the massive combined terminal so there won’t be any domestic terminal by around 2021. This maybe isn’t quite at crazy as it sounds. There are some automated cable drawn peoplemover systems thar trun on lightweight elevated girder rails that might be a effective solution. Super fast headways, low operating costs, not traffic congestion. Puhinui might be a bit far for that, but look at the Caracas CableTren Urbano for example. If you want high frequency off road shuttle between two points, that would be the way to do it. Exactly, a light rail system. Lets build one of those, and lets use standard geometry so it’s way cheaper than a bespoke system that only uses one rail. Well yeah, it’s not exactly light rail in the conventional sense, but a bespoke ‘duo-rail’ system. The advantage of those is low opex and that they can be built elevated relatively cheaply. Compared to elevating conventional light rail or heavy rail that is. I’d love to see any evidence that it is cheaper to elevate these then a traditional LRT line. This is another case study in Frankfurt. It links two terminals. I used it a couple of years ago to get out to the local heavy rail link 3.8 km away – https://en.wikipedia.org/wiki/SkyLine_(Frankfurt) The local station connects to Cologne and other cities of Germany via commuter rail and ICE intercity express. Definitely some parallels there with what Puhinui could become. I think the key issue for this sort of application in Auckland is the fact we are talking about 8km or so out to Puhinui/Manukau, where most of these cableliner systems are no more than a few km. Interesting that this might be a good option for Akoranga-Takapuna. That’s only 1.5km, probably only one intermediate stop at Barrys Point, and you’d probably have to elevate quite a lot anyway. “Interesting that this might be a good option for Akoranga-Takapuna. That’s only 1.5km, probably only one intermediate stop at Barrys Point, and you’d probably have to elevate quite a lot anyway.” – Yes good idea, it is a odd little bit of landscape / urban form to give good rapid PT coverage to. Forget feather-shaped bridges and connect your main international airport to its city with a rail link! It works, well, everywhere else. I can fly to Auckland in a state of the art, double-decker plane from the middle east and then I have to get on a shonky mini-bus or coach to get into the city. Bonkers. Well it’s not really the airport company that would be building a rail link, it would be AT with the council’s funding (hopefully funding from central govt. as well). So the airport company is going ahead with their “precinct” plans, while keeping a rapid-transit corridor available for AT to go in and build it. Hopefully the impending announcement by Mr. Bridges about KiwiRail and rail projects’ funding will directly or indirectly bring the airport rail project forward a few years. Maybe we’ll see a “Railways of National Importance” – something like what NZ First is proposing in their policies. Does Sky Bus have an agreement with AT that means the only routes the journey planner will show to the airport include Sky Bus? Someone who flies frequently showed me how to trick the journey planner into showing the other routes, but I’ve forgotten how. The difference in price from my place is $15 ($4.85 vs $19.85). This could have quite an impact on passengers’ choice of driving or PT. If using Google Maps I often click the prefer train option (but Google Maps doesn’t give you the price). Using the old “AT Metro” app, you probably have make a starting point near a train station perhaps then work out how to get near that separately…ahhh you can do in the advanced tab and tick all the operators except Sky Bus. Their new “AT Mobile” app seems to not handle it either unless you are really near a station. I find Google so much better usually, remembers previously searched places etc. Only fault with it is valid walking routes are sometimes missing or wrong. Other advantage is that it has business names etc that you can use rather than an actual address (which you sometimes don’t know off hand). Thanks Grant, that works well to tick everything but Sky Bus. It gives lots of options, and most of them are just as quick as the quickest Sky Bus option. And yes, a $15 difference. For a couple, that’s a $30 difference. Surely this is having a huge effect on individual choices about driving or taking a cab, etc. What’s the deal between AT and Sky Bus? Is it legal? +1, this pisses me off no end. I did a search Albany to Airport the other day and got four times each for four different ways to get to the skybus, but no recommendation for the 380. From Albany the difference was about $18 on Hop. Must have missed it but I can’t see where they have reserved space for the new HR station or even the light rail platforms. So no rail RT but instead an iconic quasi-maori symbolistic bridge that I can ponder in awe and wonder while stuck in the traffic congestion. Great. On the map above in white. You missed it. Although the station should be located where #5 mark is (50m) rather than approximately 200m away from the terminal buildings. Oh I agree, there is no reason for not having the terminal in the terminal! Except not wanting to make that option too good, perpahs? Step out of the terminal, over a covered bridge, and onto the platform. That sure looks like some heavy weight stands to hold that up. Are we going to make the same mistake as Britomart and have a deadend station rather than a through station? That is if we have one at all. On the AT video, it shows the two LRT stations, one of which crosses elevated & attached to the terminal on the West side. see here (I was trying to nut this out one day) https://www.dropbox.com/s/eaz36qxcv7mmvzo/Airport%20LRT%20approach%20into%20terminal%20from%20AT%20video%204.JPG?dl=0 This master plan one looks more like a HR alignment idea? Yes, I recall that report comparing Light Rail to Heavy Rail also had the stations for each option where the video shows. The idea of having a station at the commercial precinct has perhaps influenced a change in the location of the station on AT’s part (and hopefully the airport’s too? But don’t you think it is curious that several things are numbered and labelled, but not the dotted white path that we can only assume is a potential PT system? But is it a bus route? Or Light Rail? Or Heavy Rail? Above ground? Below ground? It certainly crosses over a number of other roads etc. Certainly they don’t want to commit to any particular thing right now, do they? There are so many strange, unanswered questions about the pictures too, as well as the map. Why are people walking down a path towards a busy road, with no destination in sight, when there is a perfectly good, brand new, virtually unused bridge just to their right? If they are trying to promote the bridge, then surely more people would be walking on it? And then in the second picture, which is obviously intended to show us how great the new pedestrian bridge is, to get away from the traffic, there’s a bloody car sitting in the street, clearly having just driven across the pedestrian bridge, and about to knock over the bloke in the Canterbury jersey who isn’t looking where he is going. 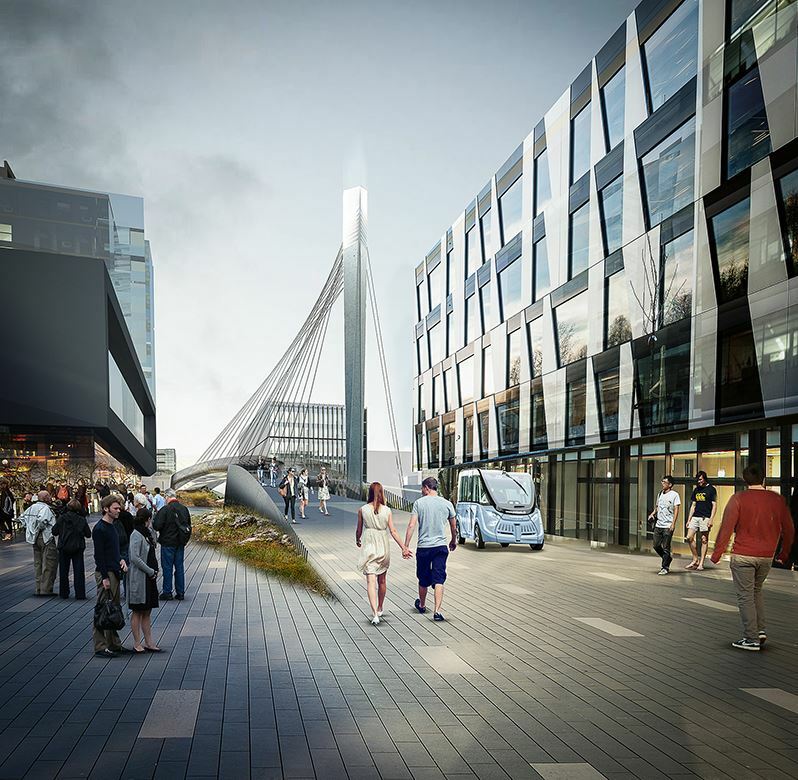 But it is a very ugly car, which indicates that maybe it is a cheap electric hybrid, and maybe they are trying to say that this is a pedestrian bridge but you are allowed to take electric cars on it too? Confusing. But not as confused as excited as when it comes to the disappearance of the crappy old Domestic terminal – it has simply vanished off the map! Along with all the planes? And all the Koru lounges and air bridges they have just spent millions installing? That curved banana of a building saying “combined international and domestic terminal” can’t stretch all the way from the current international terminal to the current domestic terminal(s) – so what gives? 🙂 Everything’s bigger and better now. Maybe the car is a modern rubbish cart, for picking up old boarding passes and unwanted promotional giveaways. The various green areas in the pictures intrigue me. They look like the builders left before doing the landscaping. Lumps of builders’ rubble and a few weed grasses. I’m all for native lowland species, but nothing recognisable there. Bring me a shrubbery. The domestic terminal is being removed and replaced by the combined international and domestic terminal, that’s been on the plans for quite a while. I think it starts in the next few years. Does that a rail corridor to the airport boundary parallel ot Puhinui road? 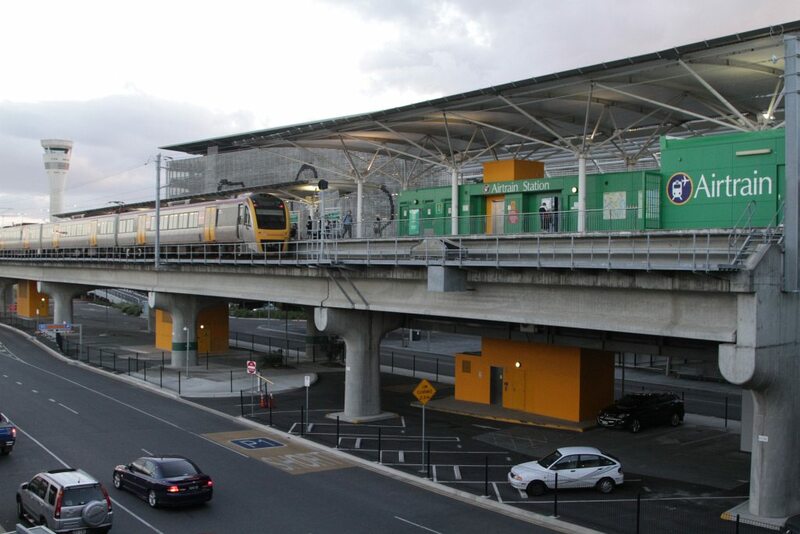 Is there move towards bus lanes between airport and Puhinui or Papatoetoe stations? Puhinui train station bus to airport? +1. Exactly – bus with bus lanes to the Puhinui interchange. I wonder – could a bus do it in 5 to 6 minutes? The Airporter 380 bus service from Onehunga Transport Centre & Train Station to the Airport should travel direct on State Highways 20 & 20A with added bus lanes for a rapid transit option. The current circuitous & long route takes around 30 minutes or more due to traffic conditions & congestion. Auckland Transport please provide & prioritise new bus lanes to the Airport now. This would also benefit the SkyBus service. I agree, Patman. This, and putting the Sky Bus into the standard bus pricing system, are the first things that should happen. Skybus should be left alone and become the premium express bus service to the CBD, like is offered by the Heathrow Express train and many other express bus services around the world. AT should pour their subsidies into bus connections to Puhinui and Onehunga, as this allows people access to a lot of other points, and also reasonable access to the CBD. Double deckers via dominion road, limited stop. 24×7 bus lanes dominion road. Would be a fairly reasonable medium term solution, could be done tomorrow for little to no capex. +1; the council is letting perfect be the enemy of better. We could have 24 hour bus lanes, stop consolidation, improved buses and a new route by Christmas. This would significantly improve things for people travelling on Dominion Road too. It would also be fairly easy to allow stops at Bader Drive and Kirkbride Road too. I guess it would be prudent for AT to wait for the outcome of the elections first as labour will build light rail. So building 10 new bus shelters, and changing 40 bus lane signs isn’t a worthwhile investment until the LRT is finished? Now 17 million passengers are 46,500 passengers every day of the year. Clearly these number suggest the whole transport link to the airport is at crisis point and will only be alleviated when another mode of transport is introduced. Good on Auckland airport for showing the heavy rail links in their map, but no mention. Now we need someone with more spine than Simon Bridges to announce a rail project. Stage 1 could be single track Onehunga/Otahuhu to Puhinui. Stage 2 double track the line. I just wish some one will do something BIG about airport transport. Rail to the Airport is going to have bigger impact than EWL. One had 1.5-2 billion and is at BOI at the moment. The other is in 50 year window sort of thing? I’ll have to make sure I point out those numbers at the hearing. Although I wonder how many of those 50k per day of passengers actually transit and don’t leave the airport. I’d say 33k workers is about 25k cars. And 50k of passengers is maybe also 25k cars. So 50k cars per day. Just the health saving from less car pollution vs rail is likely to be noticeable. “We forecast the number of daily trips to and from the airport will increase from 63,000 today to 140,000 in 2044. The majority of these trips today are in private cars. To reduce congestion, the balance between private car use and other modes of transport will need to change. Our 30 year vision includes a wide range of transport modes to provide Aucklanders and visitors with greater choice and flexibility. We are proposing better public transport, better parking facilities, improved pedestrian and cycle access, and a better roading network in and around the airport. 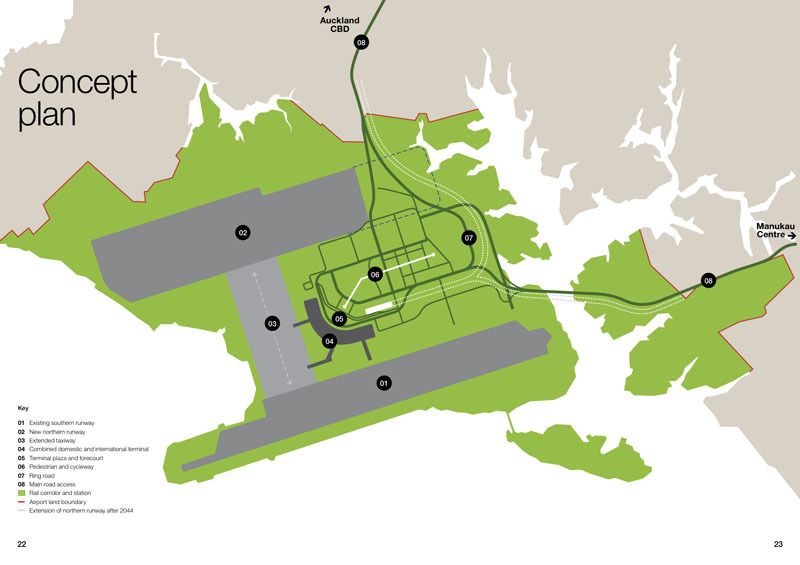 We have protected land for a rapid transit network connection to the airport and allowed for an underground station at the terminal. We have designed space for an additional express bus service, created extra bus lanes and improved facilities for local buses and shuttles. So, officially, they are only saying: “protected land for a rapid transport connection” and an “underground station”. Which is about as non-committal as they can get – in other words, we’re not going to do anything, but leave a space in case AT want to spend their money doing something there. Also – the position of the proposed possible underground station is nice and close to the domestic end of the terminal, which is great for domestic transfers into Auckland – but correspondingly, worse for international passengers who are probably expected to get a taxi into Auckland rather than catch any Rapid Transit. They should plan for a loop turnaround at least, and a potential second stop at the other end of the terminal.